In late January, the world’s attention was drawn towards what was deemed by many as a possible turn of events in Korean politics. Mr. Kim Jong-un has for the first time addressed Moon Jae-in as the president of South Korea in his 2018 New Year speech, and proposed a senior-level talk about the arrangements of the North’s participation in Pyeongchang Winter Olympics and other issues. 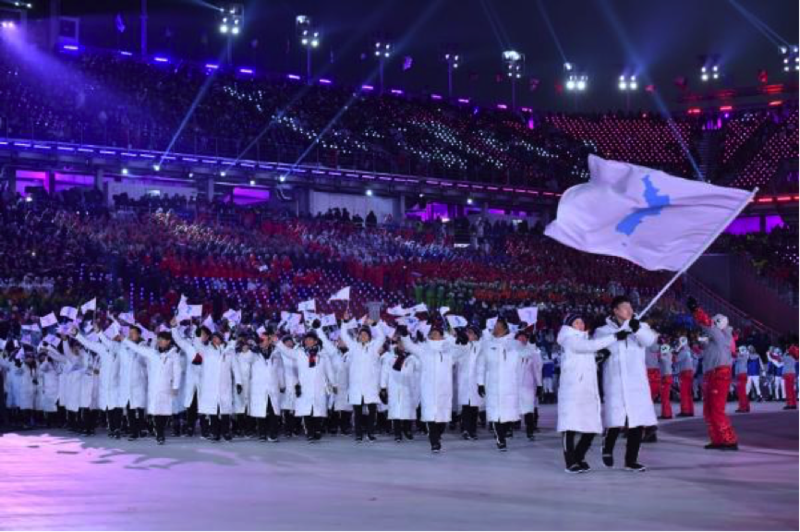 During the opening ceremony, athletes from North and South Korea jointly entered the stadium holding the flag of Korean Unification. On 10th February, Kim Jong-un’s sister Kim Yeo-jong handed a handwritten letter to Moon, officially inviting him to visit Pyeongyang. Being almost entirely isolated from the world community, North Korea has considered nuclear weaponry the only means of deterrent against any country that tries to topple the regime. They have claimed that North Korean missiles have the ability of striking the American homeland, and that they have successfully tested a hydrogen bomb. While the rest of the world remains sceptical, these claims nevertheless carry some obvious weight. In the last year, the tensions between Trump and Kim have pushed the relationship between the two to the possible edge of war. North Korea has specifically threated to attack Japan and Guam, prompting Trump to later warn Kim that he has a “larger button on the desk”. As a result, the United Nations passed a directive to enforce harsher sanctions on North Korea. So, who is Kim Jeo-jong? And what kind of pull does she now have in the North Korean regime? Being Kim Jong-un’s sister, they have both studied in Switzerland as children of North Korean diplomats in their youth. 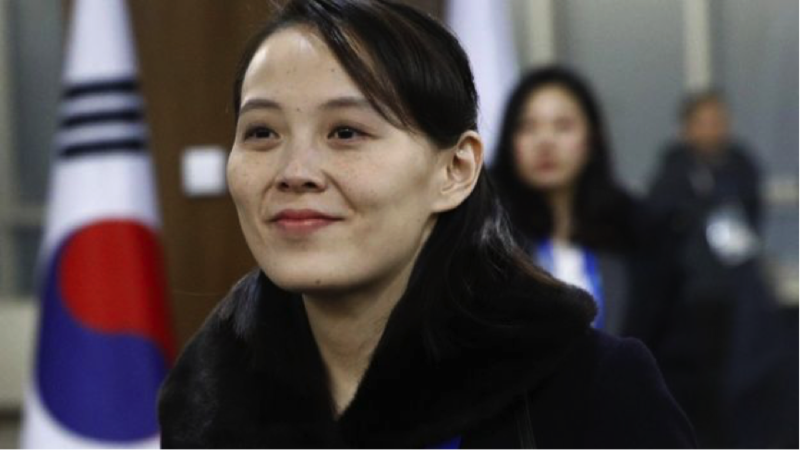 She started working at a high-level position in North Korea’s Worker’s Party at 2011, one year after Kim Jong-un had stepped into the country’s centre of political power. She has worked as Kim’s private secretary since 2013. Her arrival in South Korea has brought a novelty to North Korean diplomacy; instead of bragging of their nuclear might, under Kim Jeo-jong, North Korea has made an effort to soften their image in the international community. Unlike Trump, Moon has been praised for his pragmatism in dealing with North Korea since the start of his presidency. North Korea has sent the most senior of their delegations to the South since the end of the Korean War. If Moon accepts Kim’s invitation to Pyeongyang, he will become the first South Korean president to visit North Korea in over ten years. However, the core conflict surrounding North Korea at the moment lies between North Korea and the United States. Interestingly, the U.S. government has reacted much less enthusiastically than South Korea to the North’s peace offerings. Pence has outwardly denied the possibility that America would lift sanctions on North Korea as a pre-condition of a North Korea-U.S. talk, stating that “the point is, no pressure comes off until they are actually doing something that the alliance believes represents a meaningful step toward denuclearization” (CNN). In short, the world should still not be too optimistic about North Korea. The Japanese Foreign Minister Kono has pointed out that it is naïve to think that we should reward North Korea because they are showing effort to engage in dialogue. North Korea may be repeating an old strategy – their interest in peace talks may just be a tactic to buy time from the harsh sanctions for their nuclear project, instead of a true willingness to give up their efforts to develop nuclear weapons.